After the end of the Great War, 2nd Battalion, the Gloucestershire Regiment were posted once again to India. On 27th January 1927, the battalion set sail from Bombay to Shanghai as part of 9th (Jhansi) Infantry Brigade), the lead element of an expeditionary force gathering to protect the International Settlement from the ravages of the Chinese Civil War that was threatening the city of Shanghai. For seven weeks the Gloucesters stood by to protect the Settlement to the north of the city walls. “SHANGHAI STIRRED – – – MEN, WOMEN AND CHILDREN GREET BRITISH TROOPS – – – (From Sir Percival Phillips) Shanghai, Monday, February 14th. No strangers have ever stirred this cynical cosmopolitan city so deeply and so diversely as did the lads from two English counties, 1,500 of them in the familiar khaki, when they marched this morning with shining bayonets and singing English airs through the heart of the International Settlement, a living pledge for the protection of British life and property. Their five month stay was at first taken up with the manning of barricades and showing the flag, in order to deter encroachment and infiltration by the rival Northern and Southern Chinese armies, particularly the Communists. 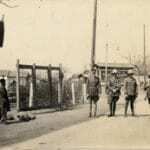 The two British battalions and 3/14th Punjabis were greatly exposed should a serious offensive have materialized, but as reinforcements poured in from stations around the British Empire, and other nations began to send their own task forces to protect their interests in Shanghai, the situation stabilized, although not without some outbreaks of heavy fighting. 12. Entry of Massed Bands and Drums with Lantern and Torch Bearers. On 23rd July 2nd Battalion and the rest of the Brigade left Shanghai and returned to India, where the Gloucesters were to remain until December 1928 before returning to England. Picture: Officers and men at a checkpoint in Shanghai.